Worldwide, the gondola is the only unique vessel, in that it is made up of many different types of wood. In 1094 the gondola was know as "Godulam". The Doge Vitale Falier ( The Head of State) had donated some gondolas to a few Venetians, in order for easier access from one part of town to another. From 1500, to 1800, up to our present times, the gondola has changed slightly in its design. And thus, even today, the gondola has maintained the same stoic black colour. 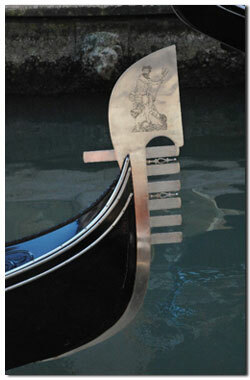 The gondola was mainly used as the primary transportation vessel fro the Venetians. 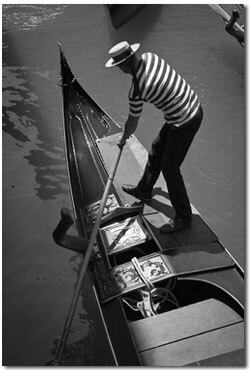 Noble Venetian families had one or more gondola's, with a gondolier at their service. He was seen as an able, loyal and trustworthy worker. With great pride and passion, these virtues have been painstakingly maintained …..
To go to the right, you will hear the gondolier call out "Stagando" and to go the left, they yell "Premando"…. and upon coming across an intersection he must call out "OEH"